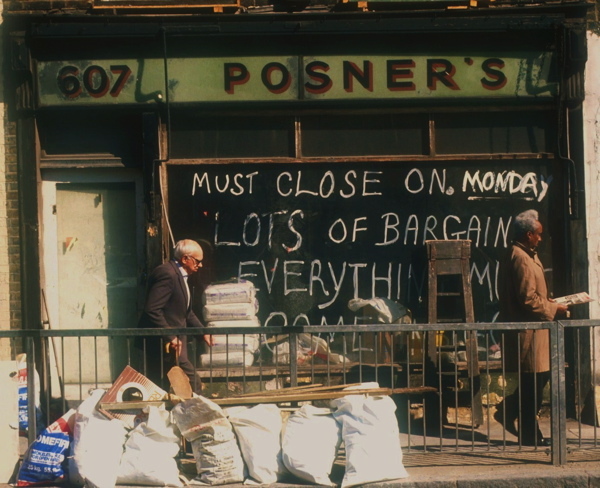 “In my twenties, I’d been doing a number of oral history recordings, working for the Museum of the Jewish East End which was very active recording stories of the life of Jewish people who had settled here.”explained Alan Dein, broadcaster and oral historian, outlining the background to his unique collection of more than a hundred photographs of East End shopfronts. 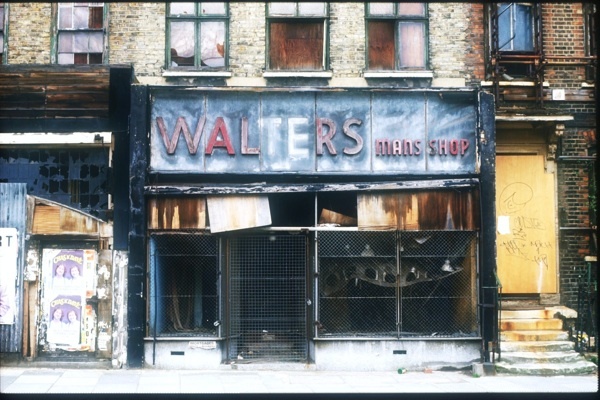 Feeding his twin passions for photography and collecting, Alan took these pictures in 1988 while walking around the streets of the East End at a time when dereliction prevailed. Although his family came from the Jewish East End and his Uncle Lou was a waiter at Blooms, Alan was born elsewhere and first came to study. 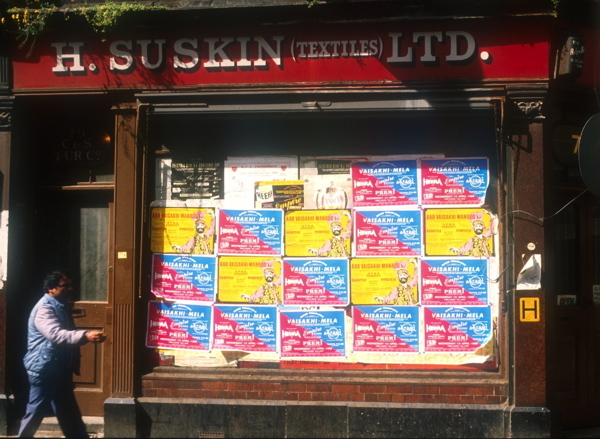 “As a student at the City of London Polytechnic in Old Castle St, I spent a lot of time hanging out here – though the heart of the area for me at that time was the student common room and bar.” he told me. 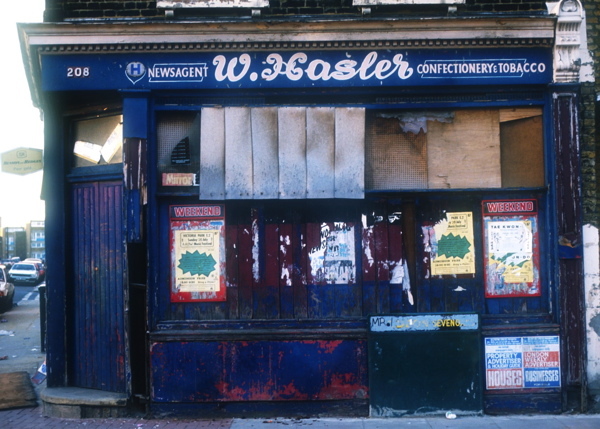 “Afterwards, in 1988, I moved back to live in a co-operative housing scheme in Whitehorse Rd in Stepney and then I had more time to walk around in this landscape that evoked the fragmentary tales I knew of my grandparents’ lives in the East End. 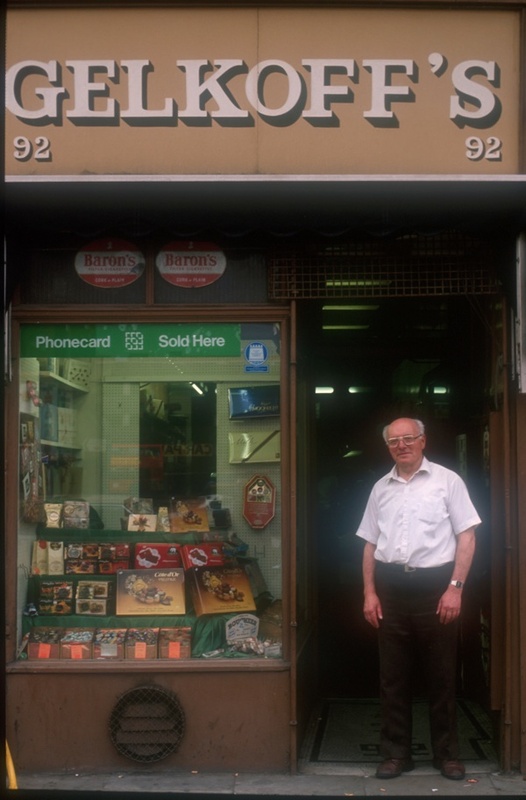 The story I heard from their generation of the ‘monkey parade’, when once people walked up and down the Mile End Road to admire the gleaming shopfronts and goods on display. My family thought I was mad to move back because when they left the East End they put it behind them, and it didn’t reflect their aspirations for me. In many of these pictures, there is an uneasy contradiction between the proud facades and the tale of disappointment which time and humanity has written upon them. 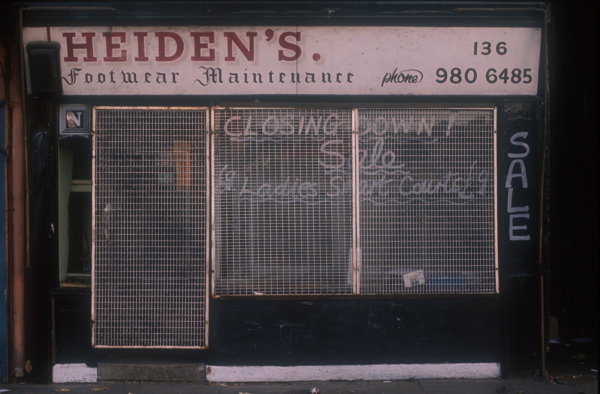 This is the source of the emotionalism in these photographs, seeing faded optimism still manifest in the confident choice of colours and the sprightly signwriting, becoming a palimpsest overwritten by the elements, human neglect and graffiti. In spite of the flatness of these impermeable surfaces, in each case we know a story has been enclosed that is now shut off from us for ever. 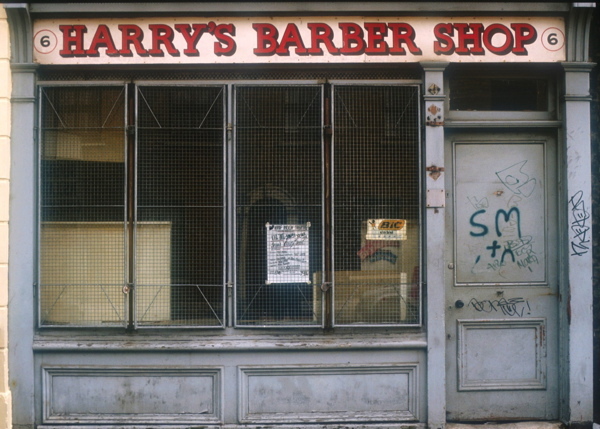 Beyond their obvious importance as an architectural and a social record, Alan’s library of shopfronts are also a map of his exploration of his own cultural history – their cumulative heartbreak exposing an unlocated grief that is easily overlooked in the wider social narrative of the movement of people from the East End to better housing in the suburbs. 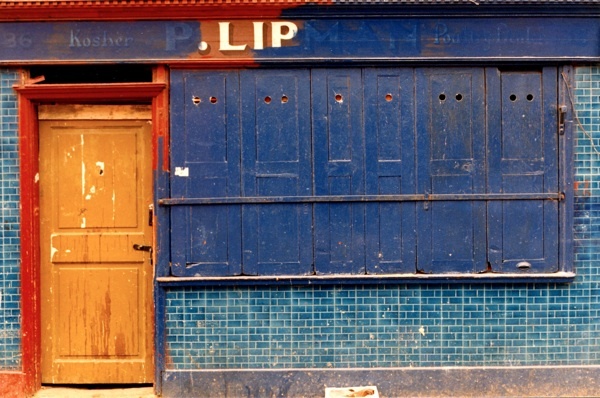 Yet Alan sees hope in these tantalising pictures too, in particular the photo at the top, of Lipman’s Kosher Poultry Dealers, in which the unknown painter ran out of paint while erasing the name of the business, leaving the word “Lip” visible. 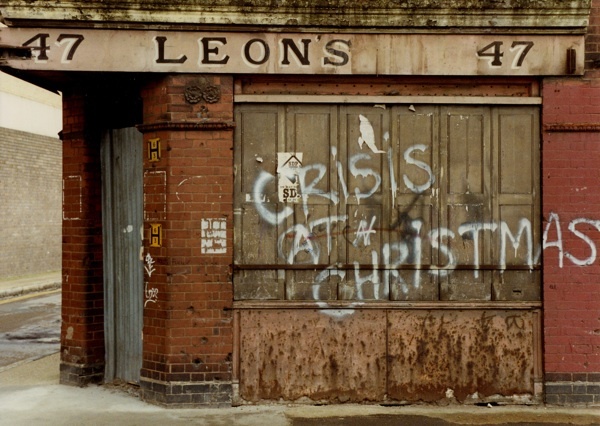 “A little bit of lip!” as Alan Dein terms it brightly, emblematic of an undying resilience in the face of turbulent social change. It’s sad to see a way of life passing (if only to North London). And Leon’s, twice in 2 days! A Jewish girlfriend took me to dinner at Bloom’s in 1986, just about at the time that Mr Dein was recording this exodus. It really was as gloriously awful as she’d promised – food that would make a dysentery sufferer costive, waiters who treated you like your surname was Herod. And yet there was an atmosphere baked into the wall’s tiles that I wouldn’t have missed for anything. 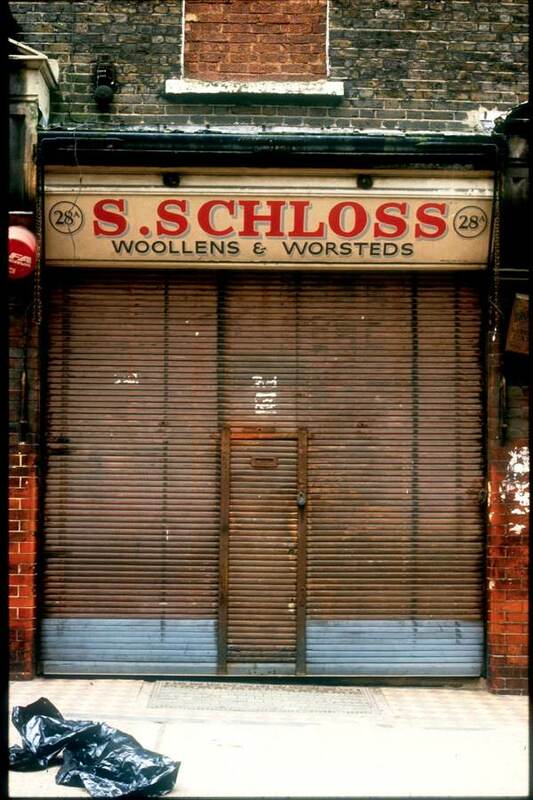 It’s great that Alan captured these shop fronts when he did at this transitional stage in 1988. 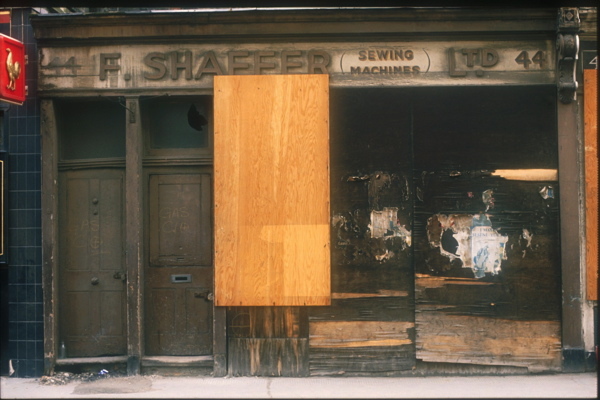 Even when they are boarded up they have a defiance about them which hints at their pivotal role in the community in years gone by. The colour is marvellous. Thank you so much, as always! Will they say that about us? Lovely pictures even on their last legs, memories I suppose. Does anyone remember the Jewish Luncheon Club? It was in Montague street I believe. The governor there always had a bottle of whisky handy for regulars, nice fish and chips. 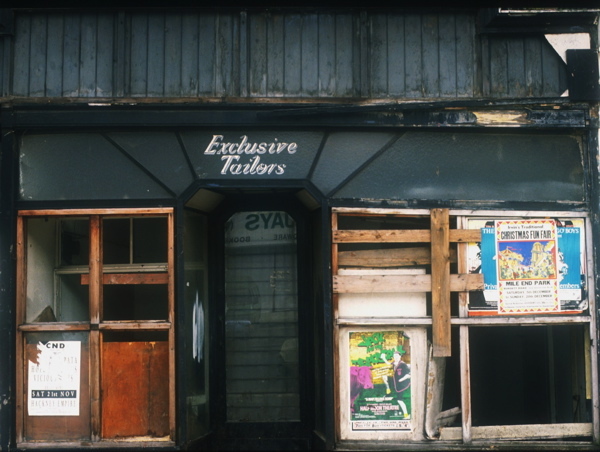 They closed Myers the tailors and Millers the menswear shop because of development, they were closed far too early it was about 20 years before the site was developed. 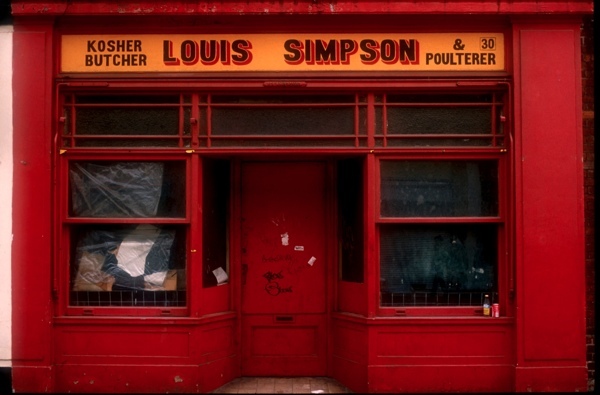 Great photos documenting the last vestiges of a particular change. 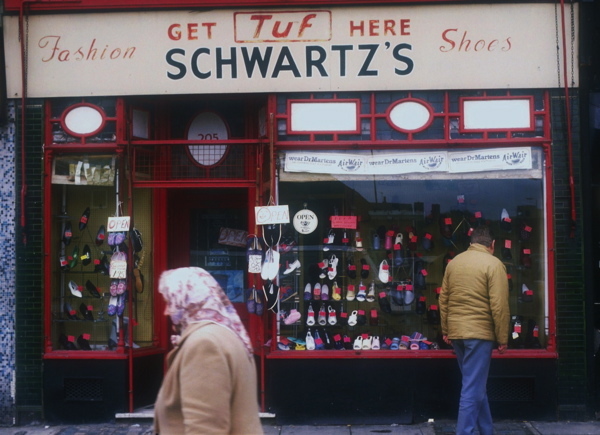 Incidentally, I remember Tuf Shoes. I had pair for school. 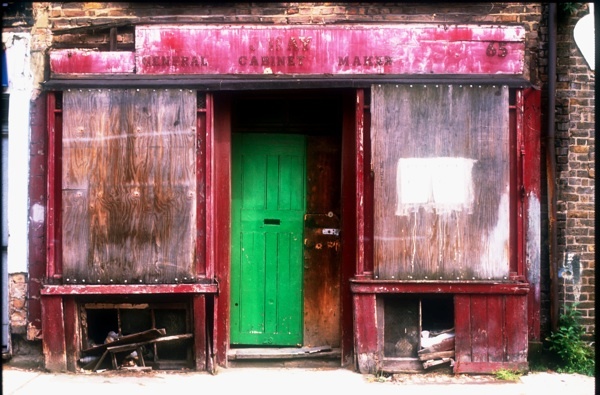 Alan has brought lots of colour to this shop front dull scene. It is important that there is a good Jewish input and recorded. 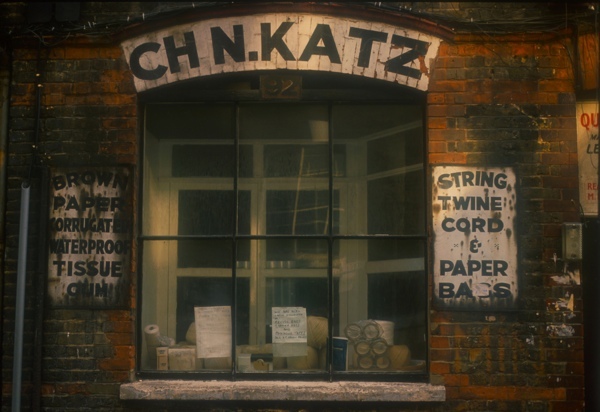 Jews played an important part in the Spitalfields community with most of the shops served all the community they worked so hard. 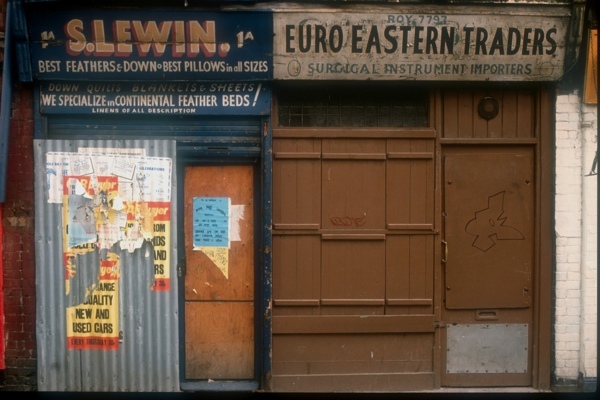 In the early days some Ashkenazi immigrants arrived in the London East End from Eastern Europe set up shop prospered and moved on, that’s it very briefly. An example is Brick Lane a continual in-out flow of different people’s. Alan; keep going with your important recording of Jewish people. 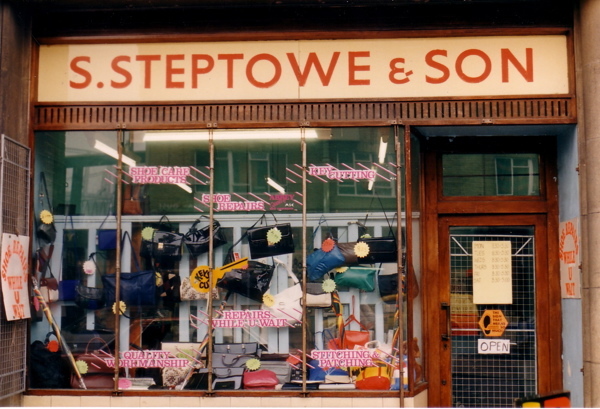 Poet John PS I noticed one shop here is owned by S. Steptowe & Son no relation to the BBC TV 1962-5 sitcom of a similar name Steptoe and Son ?or is it. Programme’s describe the ‘adventures’ of a London horse and cart rag & bone team still a available. 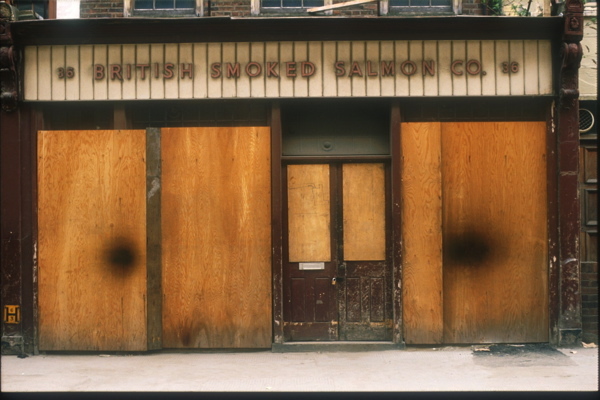 Such a shame that all those old shops have gone, a part of British history has disappeared. 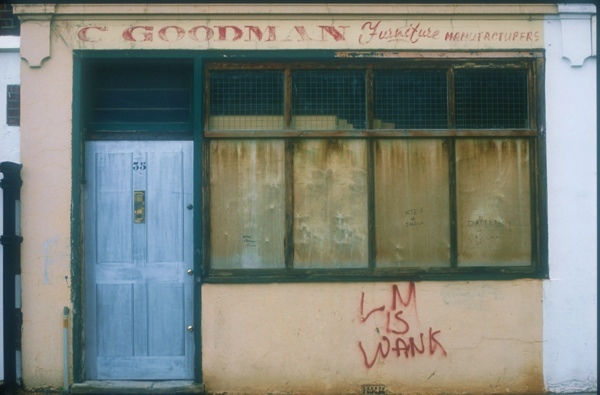 really lovely photos, especially P.Lipman in its eery Meditaranean hues. 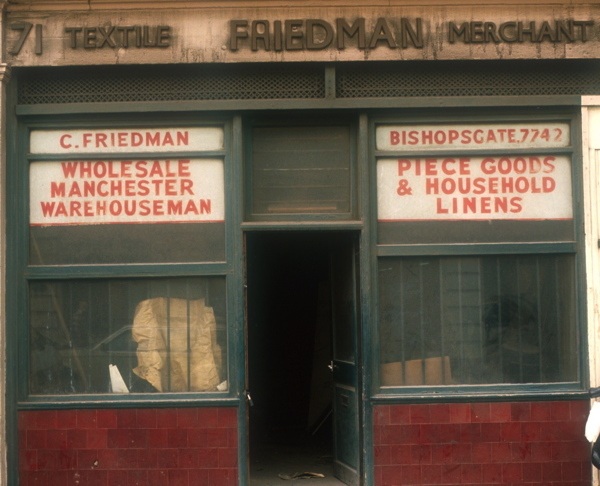 Alfred Myers: I think this shop was owned by the uncle of Millie Blatt, late of Wheeler House and wife of Allen Blatt, who was a Communist councillor in Stepney. 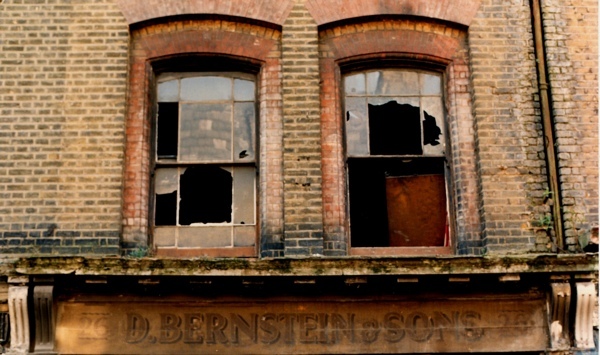 Sad and beautiful – the Redchurch Street one looks like a Howard Hodgkin! Beautiful, individual shops, we are a nation of shopkeepers, small entrepreneurs are a fabric of our society. There are so many reasons to appreciate this series. I love the full-frontal perspective, the amazing colors, the textures of decay, the infinite details, the story-telling (thank you Gentle Author), and I would be first in line if this grouping were available in book form. This is a remarkable series. 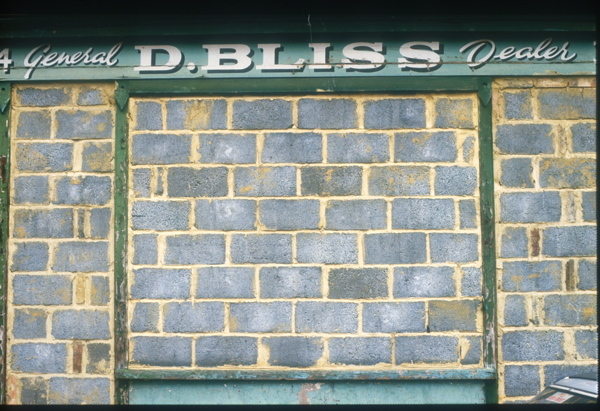 That last photo, with the cement blocks “filling” the storefront? — A stunning conclusion. witnessing; thanks to the photographer and GA.
Gorgeous pics. Always a tonic to visit here. 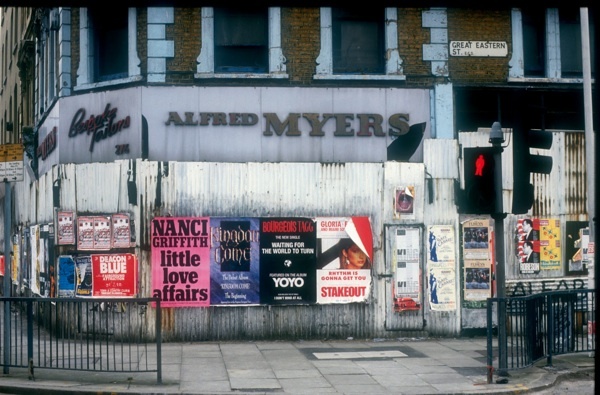 Great photos Alan to a vanished London,keep up the good work. Great photos. 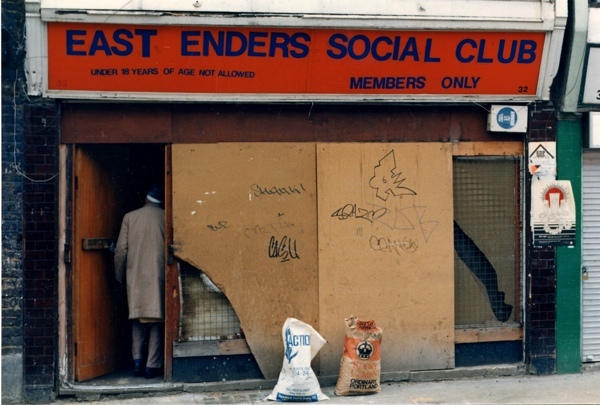 I am now 80 and recall the Old East End and the people. 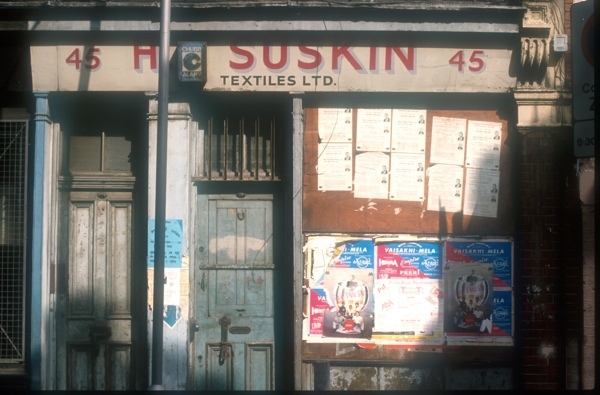 My late father’s family lived there, and my husband’s mother was born in Hessel Street. 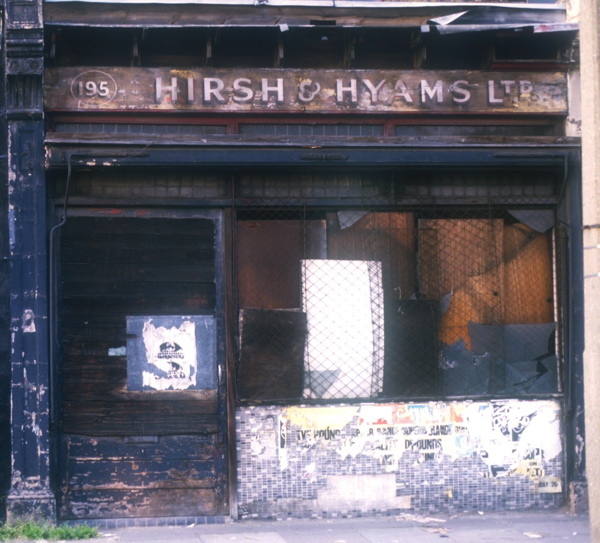 My late uncle had a material shop nearly opposite the old London Hospital, and kept two huge Great Dane dogs upstairs where he lived. I was a student nurse, at the London Jewish Hospital from 1952-1954 in Stepney Green. 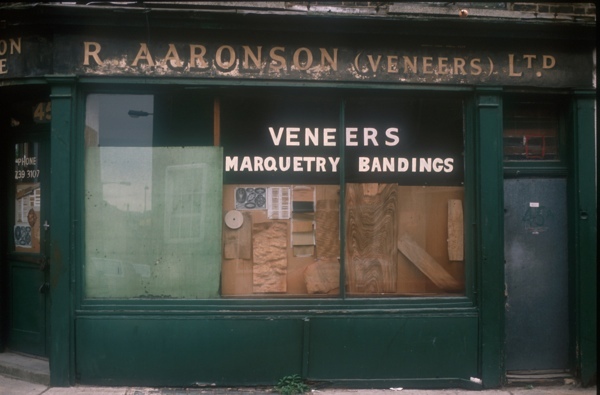 In, 1958 I had a Sunday morning job at a children’s and babies wear shop called Abrahams in The Lane. Fine people. Sorry to say, the Anglo Jews of today are not up to the old timers. They appear timid, “shtoomers” and afraid to stand up for themselves. I lived in Israel from the sixties and only returned here for family obligations, and to me it is a foreign country. The old days were better!. 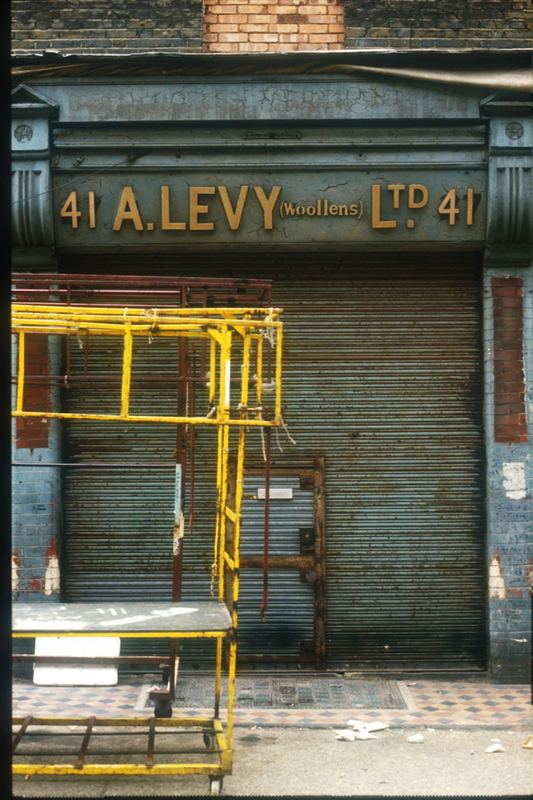 These are the captures I much enjoy regarding to the urban”landscape”, depicting a bygone era in its last days. 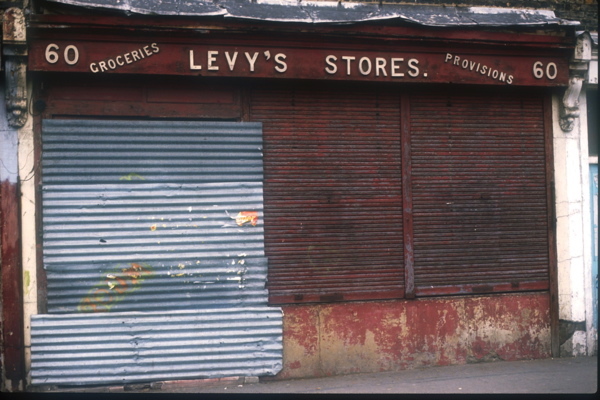 Strongly decayed storefronts with their faded signs & patched doors really fascinate me & are infinite sources of inspiration for my artworks. Great to find and enjoy these rare pics from the late 80′s.